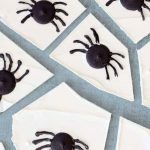 Graveyard chocolate bark Halloween treat with video tutorial. 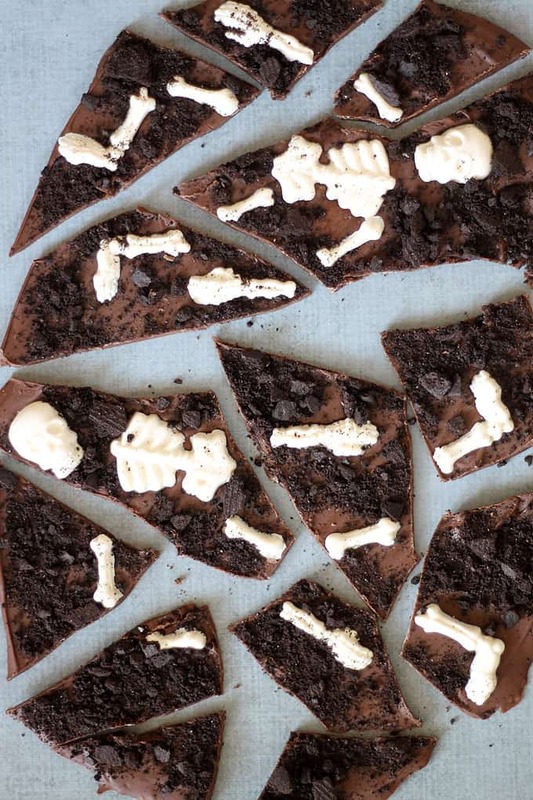 This graveyard chocolate bark is an easy, spooky Halloween treat you can whip up in minutes. 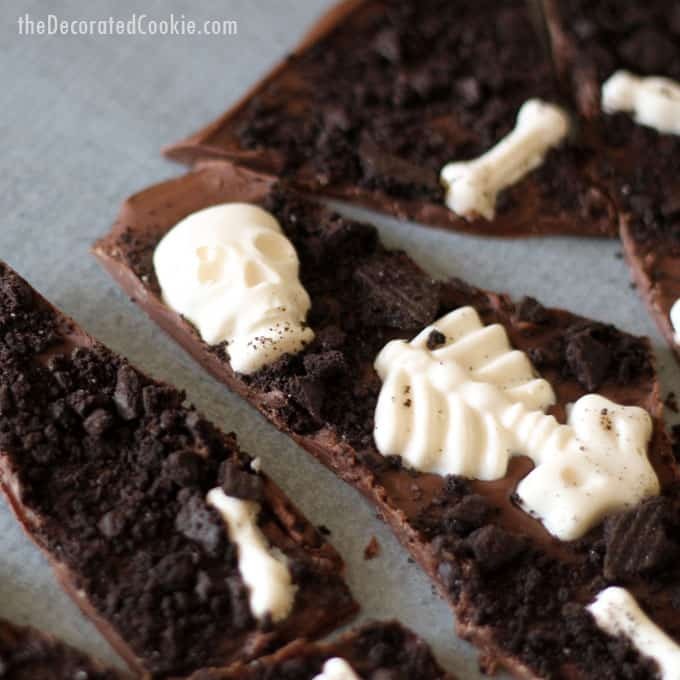 All you need to make the bark is milk chocolate chips (or dark or vegan or whatever you prefer), white chocolate or white candy melts, the skeleton candy mold, and some chocolate wafers for “dirt.” You can also use Oreos for the dirt, if you prefer. But I love the Nestle chocolate wafers. Melt the white chocolate chips or white candy melts according to package directions (1/2 cup should be enough to fill the candy mold, but you may want to add a bit more to be safe), or, at 70 percent power for 90 seconds. Continue to heat at 15 second intervals until mostly melted, and stir so the residual heat completely melts the chocolate. 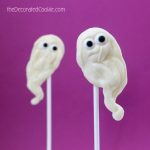 NOTE: If you’re using white candy melts, you can melt these directly in a disposable decorating bag. White chocolate melts hotter, so be sure to melt these in a bowl. If you don’t want to risk the heat in the bag, you can use a little spoon to fill the mold. Pipe or spoon the chocolate into the mold and bang the mold on the counter to settle. 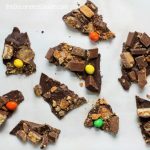 Use a dough scraper (if you have one) or a knife to clear as much of the chocolate or candy melts from the top of the mold as you can. Let set well and remove from the mold, using your fingers or a paring knife to clear away bits of unwanted chocolate. Melt the chocolate chips in a microwave-safe bowl. 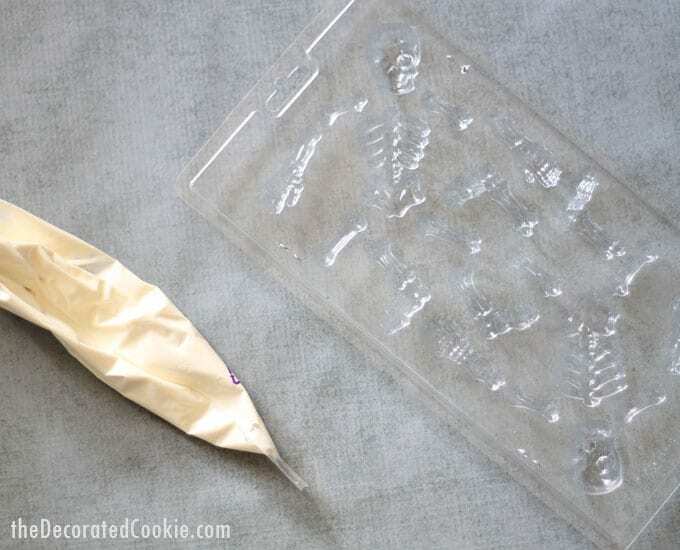 Scrape the chocolate onto a baking tray lined with wax paper and spread the chocolate in an even layer. You will only fill about 3/4 of the tray. A large offset spatula is a great tool to use here. 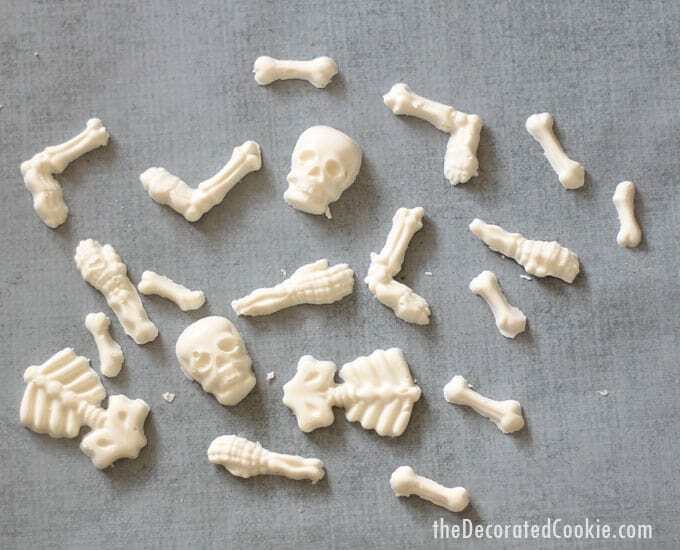 Arrange the skeletons on the chocolate. 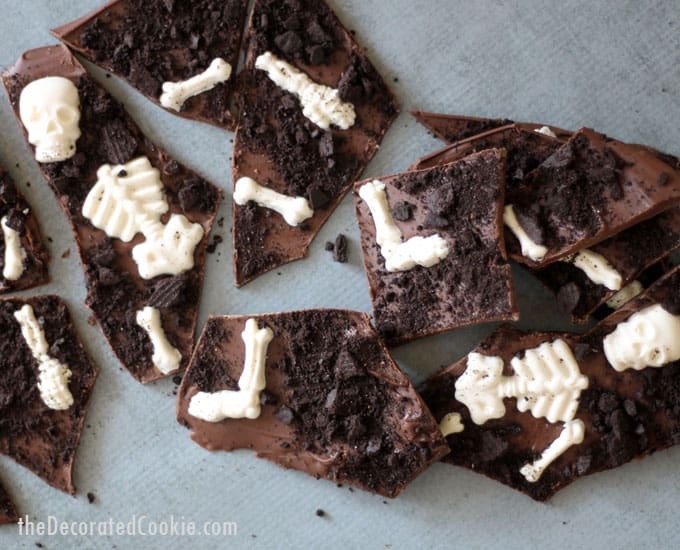 Sprinkle the crushed cookies around the skeletons to cover the chocolate. Let set (I put this in the fridge) about 30 minutes and score the chocolate with a knife where you’d like to later break it into pieces. Let the chocolate full set and carefully break into pieces. 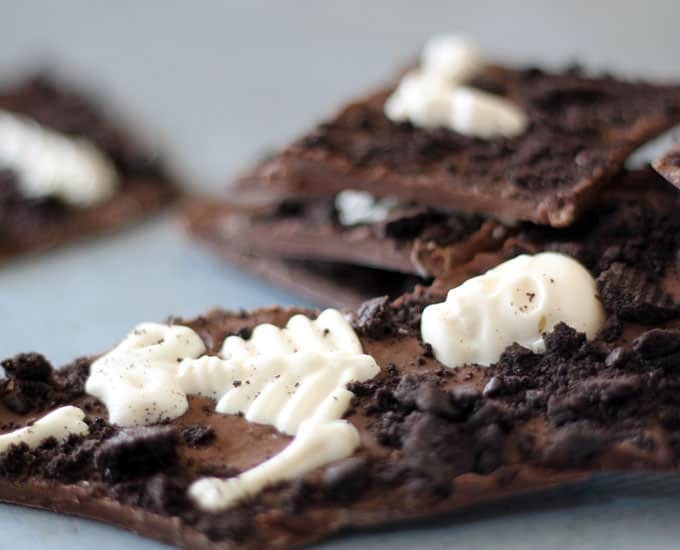 TIP: You may want to overturn the pieces to remove the excess cookie crumbs that didn’t stick to the chocolate. Melt the white chocolate chips or white candy melts according to package directions (1/2 cup should be enough to fill the candy mold, but you may want to add a bit more to be safe), or, at 70 percent power for 90 seconds. Continue to heat at 15 second intervals until mostly melted, and stir so the residual heat completely melts the chocolate. 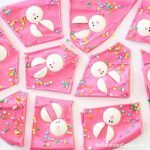 NOTE: If you're using white candy melts, you can melt these directly in a disposable decorating bag. White chocolate melts hotter, so be sure to melt these in a bowl. If you don't want to risk the heat in the bag, you can use a little spoon to fill the mold. 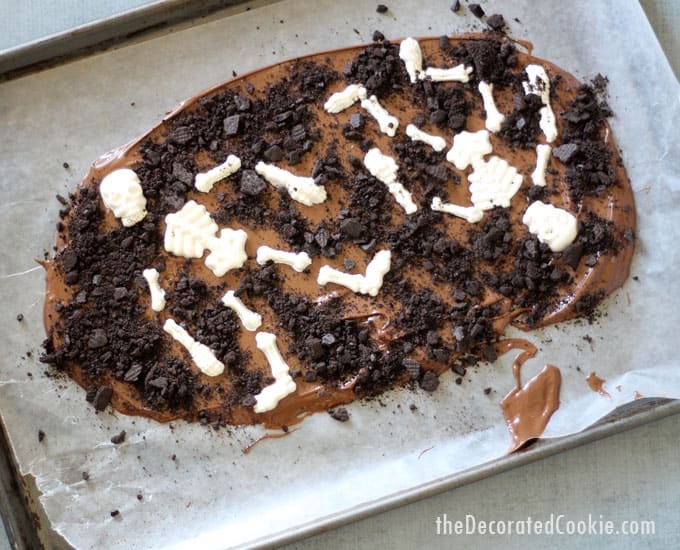 Pipe or spoon the chocolate into the mold and bang the mold on the counter to settle. Use a dough scraper (if you have one) or a knife to clear as much of the chocolate or candy melts from the top of the mold as you can. Let set well and remove from the mold, using your fingers or a paring knife to clear away bits of unwanted chocolate. 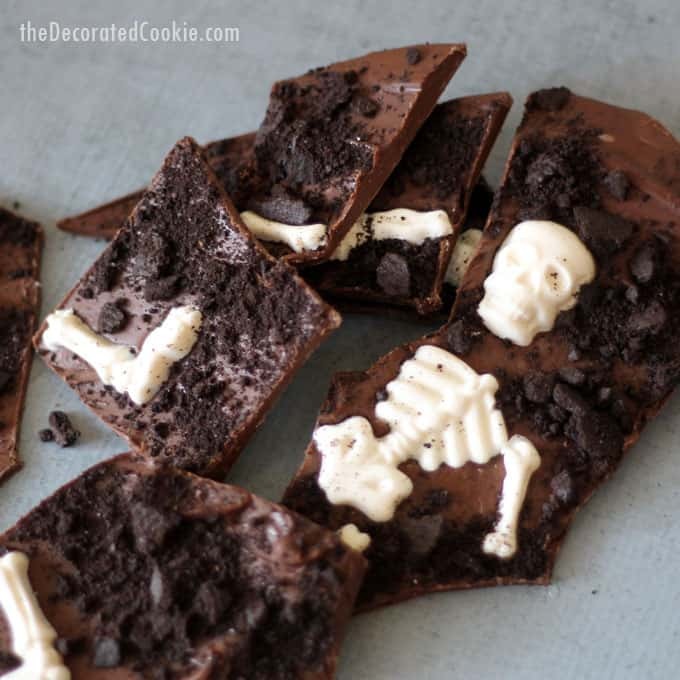 Arrange the skeletons on the chocolate. 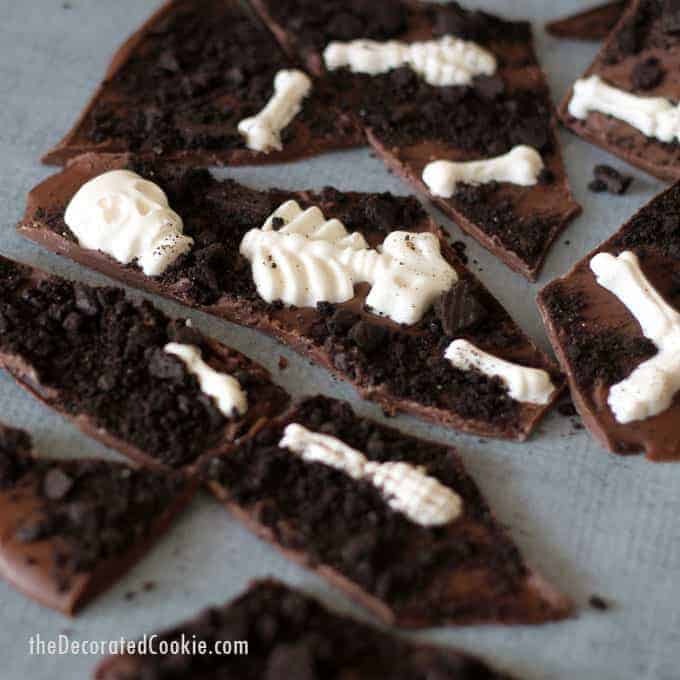 Sprinkle the crushed cookies around the skeletons to cover the chocolate. Let set (I put this in the fridge) about 30 minutes and score the chocolate with a knife where you'd like to later break it into pieces. Let the chocolate full set and carefully break into pieces. 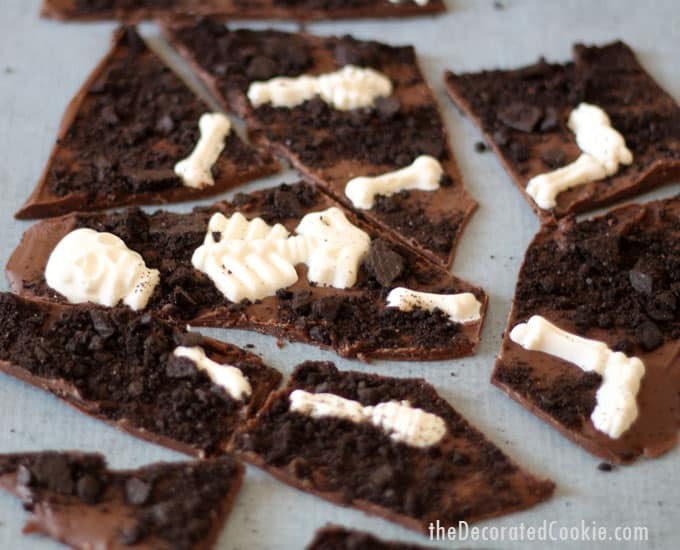 TIP: You may want to overturn the pieces to remove the excess cookie crumbs that didn't stick to the chocolate. Did I miss it somewhere but unable to find the printable button. Thanks Colleen! And oopsy. Will add a recipe/printable link now!